Chief embalmer of John Snow & Co.,John R. Snow Jr. Bodies that were brought back were either transported by relatives to their final resting place or interred in Halifax, Nova Scotia. On this date in 1941, Japan launched a carrier based strike on U.S. military forces based in Pearl Harbor, Hawaii. Their strategy was to use this attack to convince the country and its leaders that war with Japan would be futile. They achieved tactical surprise as no warning of an attack had yet been received. While decryption of their codes had revealed their intent, the warning did not reach Pearl Harbor until after the attack had begun. The Japanese legation in Washington did not deliver their government’s official response to a recent diplomatic exchange until after the attack due to problems in transcribing the message. The attack began at 07:55 local time (12:55 p.m. eastern standard time). 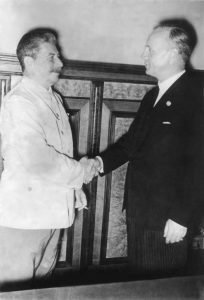 It was early afternoon when President Roosevelt was notified by Secretary of War Henry Stimson of the attack. There was some doubt among some staff as to the validity of the report but President Roosevelt believed it. And subsequent reports would show it was true. Radio was soon reporting on it as well and the entire nation soon learned of the shocking event that had taken place in the faraway location. 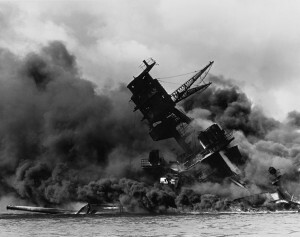 The purpose of the attack was to seriously cripple the U.S. naval and air operations (both the Navy and Army Air Corps). 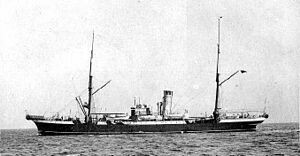 The surprise was effective and sank or crippled numerous American ships. However the jewels of the fleet were the aircraft carriers and they were not there. And the Japanese had no idea where they were. After conducting the first two strikes, a third strike was considered to more completely wipe out the storage, maintenance and dry dock facilities. Captain Minoru Genda,who helped in the planning,argued for invasion to maximize American losses. Admiral Nagumo decided to retire because of deteriorating weather, the unknown location of the American carriers, the long turnaround time required for a third strike that would allow American forces to gather and counterattack, and the fact the Nagumo’s strike force was at the extreme limit of logistical support. They were low on fuel and another strike would require them to travel at reduced speeds to conserve fuel. So he headed home. Much later Admiral Yamamoto, who supported the decision at the time, would in retrospect say it was a mistake since it allowed the U.S. to come back quickly. Most of those who died at Pearl were sailors aboard the ships that were damaged or sunk. Of the 2,008 sailors killed, 1,177 were killed when the forward magazine on the USS Arizona exploded. Eighteen ships were sunk, beached, or run aground. 188 aircraft (mostly Army Air Corps) destroyed, 159 damaged. Most of the planes were destroyed on the ground. Only eight pilots got airborne and did attack Japanese aircraft but only one was shot down. Some pilots were killed or shot down later by friendly fire. Five inbound planes from USS Enterprise were shot down. The Navy lost 24 of its PBY planes. Additional casualties came from when Japanese attacked barracks. 2,403 Americans killed and 1,178 others were wounded. Since the U.S. was not at war, they are all classified as non-combatants. The Japanese lost 55 airmen, nine submariners and one captured. They lost 29 planes in battle and 74 were damaged by antiaircraft fire. Most Americans were enjoying a pleasant Sunday. Secretary of State Cordell Hull met with the Japanese ambassador around 2:30 p.m., just when the first reports were coming in about the attack. 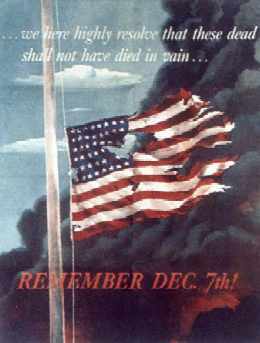 Popular Sunday afternoon radio shows were interrupted with the stunning news about the attack on Pearl Harbor. From coast to coast, Americans were riveted to their radios listening to the latest updates. Lines of volunteers began forming outside military recruitment centers. The isolationist sentiment was ushered to the rear while most of the nation united against the Japanese. 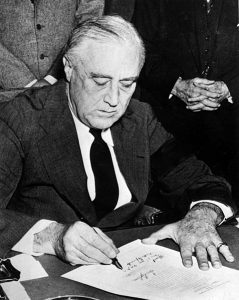 On 8 November before a joint session of Congress, President Roosevelt asked for a declaration of war. Yamamoto would not survive the war. President Roosevelt ordered that he be taken care of for his part in planning the Pearl Harbor attack. Thanks to the work of U.S. Naval Intelligence that had broken Japanese codes (code named Magic), his travel plans to the South Pacific in April, 1943 were learned. Orders were given and select pilots were used to target a very important high officer but were not told who it was. On 18 April 1943, a squadron of Lockheed P-38’s were assigned to intercept and bring down his transport being escorted by Japanese zeroes. There were two Japanese transports. After a dogfight with the Zeroes and transports, the transport with Yamamoto’s plane crashed into the jungle north of Buin, Papua New Guinea. Japanese search parties found his body, thrown from the aircraft and under a tree. He had two .50 caliber bullet wounds, one in his left shoulder and the other that had exited through his right eye. The true manner of his death was hidden from the Japanese public and not revealed until long after the war had ended. He was cremated, given a state funeral, and given posthumous titles and awards. Today the place where his plane crashed is a tourist attraction. Brian Ticehurst, who was a founding member of the British Titanic Society and did much to expand knowledge of Titanic, passed away recently at age 82. He did a lot to bring information about Titanic survivors, memorials, and the ships crew to light. 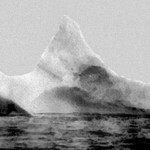 His deep knowledge of Titanic made him a well known expert who frequently contributed his knowledge through books, articles, and online forums. 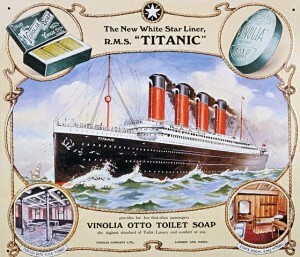 He even was asked to testify in court trials concerning Titanic memorabilia. 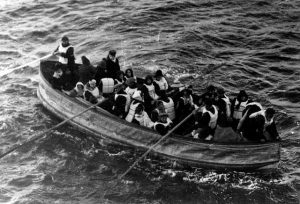 It is through him that much about the Titanic’s crew and Southampton were documented. And still are required reading to this day. His contributions to our knowledge of Titanic will never be forgotten. RIP Brian. 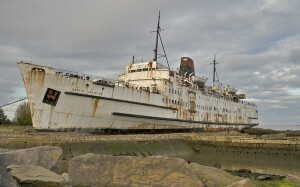 SS Duke of Lancaster-Zombie Ship? Expected to open next year (no doubt in time for Halloween), the ship will be used to allow thrill seekers to roam about and of course encounter zombies in the process. Actors are being sought now to play certain roles, from zombies to doctors, as the ship will be overrun by zombies. It will apparently only be open weekends. Zombie Infection, the company behind it, promises it will bring new glory to this old ships. A few days ago the 80th anniversary of Amelia Earhart’s disappearance went by without much notice in the press. There was some obligatory mentions in This Day In History write-ups and a mention of a possible finding of her plane. So who was Amelia Earhart and why was she important? On 20 May 1932, five years after Charles Lindbergh made his famous solo nonstop flight from the U.S. to France, Amelia Earhart set out to be the first female aviator to accomplish the same feat. Unlike Lindbergh, Earhart was already well known before this flight. She gained fame in 1928 as part of a three person crew to be the first woman to cross the Atlantic in an airplane. On that trip, she kept the plane’s log. Early on 20 May 1932, her Lockheed Vega 5B took off from Harbour Grace, Newfoundland. She intended to replicate Lindbergh’s flight but encountered strong northerly winds, mechanical problems, and icy conditions. Instead of landing in France, she landed in a pasture at Culmore(north of Derry)in Northern Ireland. 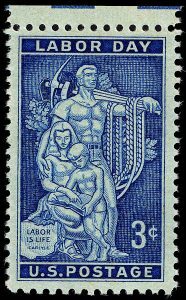 When asked by a farmhand how far she had flown, she famously said “From America.” Her feat received international acclaim. She received the Distinguished Flying Cross in the U.S., Cross of Honor of the Legion of Honor from France, and the Gold Medal from the National Geographic Society. Her fame allowed her develop friendships with many important and influential people such as First Lady Eleanor Roosevelt. Earhart would continue to make solo flights and set records. Sadly her next most famous mission would forever be shrouded in mystery. In 1937 she attempted–along with copilot Frederick Noonan–to fly around the world. On 2 Jul 1937, her plane disappeared near Howland Island in the South Pacific. Despite extensive searching by the U.S.Navy and Coast Guard, no trace of the plane or its pilots were ever found. 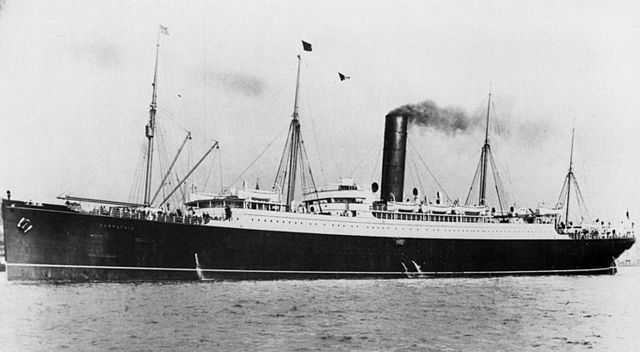 The search was called off on 19 July. 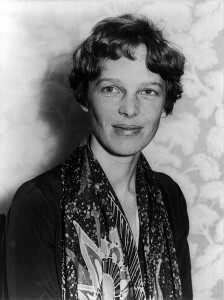 Earhart was declared legally dead on 5 Jul 1939 so that her estate could pay bills. Since then numerous theories as to what happened have been put forth. Many believe her plane either crashed and sank or that they landed on an island and perished awaiting rescue. Some intriquing evidence recovered in 2012 off Nikumaroro might be from their plane which supports the crash and sank hypothesis. More speculative theories have her being a spy for FDR or being captured and executed (along with Noonan)by the Japanese on Saipan (the area checked for the pilots bodies revealed nothing). A 1970 book claiming she had survived, moved to New Jersey, and changed her name to Irene Craigmile Bolam. There really was an Irene Bolam who had been a banker in New York in the 1940’s. She sued the publisher and obtained an out-of-court settlement. The book was taken off the market. National Geographic debunked it in 2006 on Undiscovered History.